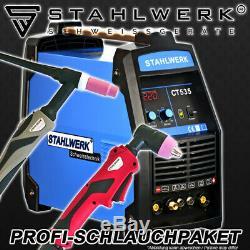 Contact with STAHLWERK Welding Machines. TIG AC/DC Welders with Pulse & Plasma Cutting. ARC-Stick, Alu welding, Plasma cutting up to 12 mm. TIG AC/DC Welders with Pulse. TIG DC Welders with Pulse & Plasma Cutting. MMA ARC-Stick, Plasma cutting up to 12 mm. TIG DC Welders with Plasma Cutting. MMA ARC-Stick, Plasma cutting up to 14 mm. TIG DC Welders with Pulse. Cutting up to 12-40 mm. DC MIG, MAG, TIG, MMA ARC-Stick. Over 100000 satisfied customers in Germany, Europe and Switzerland. Test welding & plasma cutting: convince yourself of our high quality! Professional Powerfull welding machine with integrated plasma cutter. Cutting power up to 14 mm. 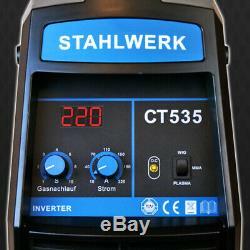 STAHLWERK DC CT 535 Plasma Cutter S. DC TIG welding devices are suitable for welding almost all materials (steel, stainless steel). In addition, the devices in this category are combiners with integrated plasma cutter. Adjustable functions and important device elements. DC WIG welding direct current. For non-alloyed and low alloy steels, stainless steel, copper, brass and so on. HF Ignition high-frequency ignition (HF) by TIG - TIG High Frequency. Reproducible welding results by HF ignition and constant welding parameters at start-up. Remote controllable current control with foot pedal (not included). Hast he advantage, that the current can be also regulated during the welding process. Gas post-flow protects the tungsten electrode from excessive wear and protects the weld seam for oxidation. With the switch 2T/4T the operating modes oft he control can be determined. This mode provides extended control over the current flow. MMA/ARC-Stick Electrode welding can be used under almost all conditions and therefore MMA welding can be described as a universal process in the welding industry. Anti-Stick -function prevents sticking of the stick electrode. In the case of a sticking of the electrode to the workpiece, the welding current is switched off. ARC Force with spray arc, also called ARC Force. This allows to regulate the arc range. Hotstart automatic voltage increase at start-up for better welding results. 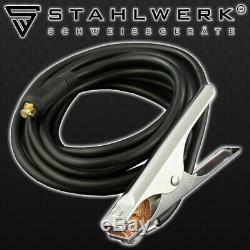 With the integrated Plasma Cutter 55 A can be cut without problems all conductive metals. For example: aluminum, steel, copper, brass, titanium and so on (depending on material). CUT contact - Absolutely easy-to-use HF high-frequency contact ignition. A light stroke over the workpiece is sufficient. With all our devices, we trust in MOSFET technology from Toshiba , whose innovative solutions set new standards in welding technology. Smart Cooling Fast cooling fan allows maximum power consumption and increases the operating time (ED) of the unit. Overheat protection starts as soon as the unit is overloaded. A yellow indicator light turns on and goes out as soon as the unit has cooled down again. The welding machine is connected directly to the single-phase alternating current (AC) 230 V (+ -15%), 50/60 Hz operation. The single-phase alternating current is to be protected in the household with a 16 A fuse. S-Guard-Housing is ergonomic, robust and operationally reliable: - Sturdy sheet steel housing, - Shock-proof, - Hard plastic formwork, - Control panel conveniently accessible and easier to operate, - Intelligent fan guide. 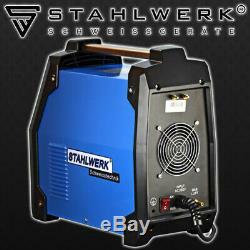 Professional machine for daily use AC DC TIG with pulse function and MMA welding, or plasma cutting. Power - TIG / MMA adjustable between 10 220 A - Plasma cutter adjustable between 10 55 A, cutting performance up to 14 mm (depending on the material). DC TIG welding machine For non-alloyed and low alloy steels, stainless steel, copper, brass etc. Gas cooled Hose package gas air cooled. Excellent quality due to fully digital inverter technology The welding machine DC CT 535 PLASMA S has the most advanced inverter technology MOSFET (Toshiba). The resultant special features such as high speed and precision of the control give the devices their excellent quality in welding and cutting. The long-lasting design and the demanding welding properties of the machines ensure a reliable daily use for the production welding work. S-Guard housing robust and reliable. Robust steel-sheet housing - Hard plastic casing protects against damage - Shock-proof - High ED (duty cycle) by intelligent fan control - Intelligent housing design with optimized airflow. Safety degree of protection by enclosure IP21: - Protection against foreign material. Protected against solid foreign material with a diameter of 12,5 mm or mor. Protection against touch: Protected against access with a finger. Protection against water: Protection against dripping water. Inverter welding machine The welding inverter is an electronic welding current source. Inverter welding machines are built for all arc welding processes such as electrode, MIG/MAG, plasma and TIG welding. Depending on the power, the devices are connected one or three phases to the electric circuit. 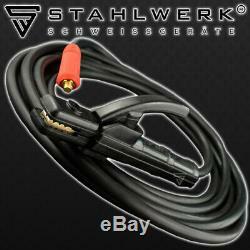 The control technology fits different Applications and greatly improves the welding performance. DC DC direct current (deutsch: Gleichstrom). For light metal, for example aluminum and so on. Not for light metals, e. TIG (tungsten inert gas) is one of most important welding for processing of high-alloy steel and all non-ferrous metals. HF high-frequency ignition High frequency arc ignition (HF) at TIG. A High frequency removal advance the sparking distance between the electrode and the workpiece. There is no direct contact between the tungsten electrode and the workpiece. The tungsten electrode does not touch the work piece so the tungsten will be prevented and the weld is not exposed any tungsten attack. Touchless ignition works in different work configurations with high reliability. Gas post flow Adjustable between 0 10 seconds. Protects the tungsten electrode from excessive wear and protects the weld from oxidation. Important to protect the welding seam from aeration and to create a gas atmosphere. Remote controllable Remote controllable current control via foot pedal (not included). The foot control mode gives you the advantage that you can control the current even during the welding process, which gives you various possibilities for the execution of the welding work. All our TIG welding machines are also suitable for MMA / E-hand welding. Anti-stick Shortly before the end, the system releases the set maximum current, which prevents sticking and annealing of the electrode. 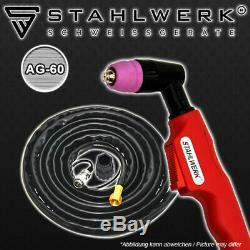 The electrode does not glow and can easily be detached from the workpiece. ARC force With spray arc, also called ARC force, can be regulated the arc width. Hotstart Prevents the sticking of the stick electrode by short-term superimposition of the set welding current and warms up the weld seam start faster. Integrated plasma cutter CUT 55 A. PLASMA / CUT With the integrated CUT 55 A, you can cut without problems all conductive metals, for example aluminum, steel, copper, brass, titanium and so on (depending on material). Precise and very stable arc. High duty cycle of 60% at 55 A. Maximum energy density with minimized heat distortion. Clean cuts which do not require post-processing. Intelligent housing design with optimized airflow. No material distortion due to heat metal waste is minimized. A plasma beam that cuts any electrically conductive meal effortlessly. Powerful cutting speed, ensuring high productivity. Due to the low deformation, thin sheets can be welded together again immediately. Cutting performance up to 12 mm (material dependent): Construction steel ST37 up to 14 mm, V2a up to 10 mm, aluminum up to 7 8 mm. Low operating costs due to the use of air plasma instead of expensive gases compressed air is used. Overheat protectio Overheat protection goes on when the unit is overloaded. Duty cycle MMA / ARC. Degree of protection by enclosure. 230 V AC (+-15%) / 1 (single phase). > 8 kVA / 1. Dimensions Length x Width x Height (mm). 500 x 220 x 430. Technical requirements Plasma / CUT Compressor. The machine Stahlwerk DC CT 535 Plasma S. AG 60 plasma hose, 4,5 meter. Plasma accessories set 3-part (installed them each one piece already in the hose package). 1 nozzle (already at the plasma torch). 1 electrode (already at the plasma torch). 1 ceramic cap (already at the plasma torch). 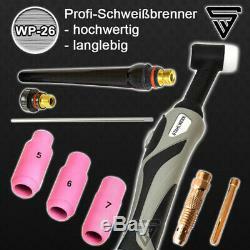 TIG Torch Package "WP-26" 4,5 meters. TIG accessories 8-part (installed them each one piece already in the hose package). 3 × gas nozzles, each 1 piece in size 5, 6, 7. 1 × adapter sleeves in 1,6. 1 × collet body in 1,6. 1 × long back cap. 1 × universal tungsten electrode. Pre-assembled accessory from the figure of the welding torch is part of the 8-piece set. Cable with electrode holder, 3 meter. This is free for you. We want to avoid transport damage. Although both packages leave our house at the same time, in some cases, the machine comes first and the accessories are delivered one day later. This is not the rule, but it happens. 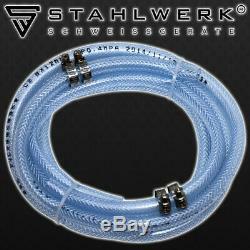 We deliver free of charge to Germany, EU and UK. In our Shop you will find everything about welding and cutting equipment includes stick welders, TIG welders, MIG welders, multi-process welders, plasma cutters, also welding accessories and welding protective clothing. 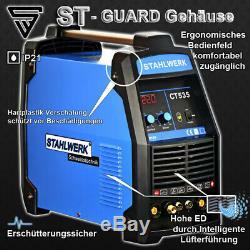 The Company STAHLWERK Schweißgeräte Deutschland e.
We are your professional and reliable welding specialist. 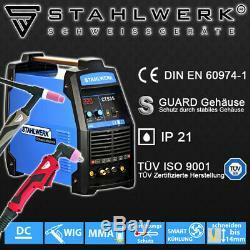 In STAHLWERK welding machines you have the latest inverter technology. Highest quality standards in a premium brand and low prices to a product-performance-ratio. With which process you also weld or cut AC, DC, MIG MAG, MMA or CUT the STAHLWERK products range leaves nothing to be desired. In particular, it relates to the circuit board and the inverter. It does not extend to the housing and its external components and connecting parts, such as the hose pack or the mass clamp. It also does not extend to the supplied accessory, which is not used in the device interior. In order to ensure optimum support for our customers, our very motivated employees are always available to answer any questions. Our employees are constantly trained and updated to the latest state of technical developments. This is a service that you can also personally convince yourself of here at any time. Visit us - We would like to invite you to a test welding in our company at Bonn. Convince yourself of our service! Sample welding on site possible. The item "WELDER STAHLWERK CT 535 PLASMA S WELDING MACHINE INVERTER / PLASMA CUTTER 55A" is in sale since Friday, September 15, 2017. This item is in the category "Business, Office & Industrial\Metalworking/Milling/Welding\Welding & Soldering\Welding\Welders, Cutters & Torches\TIG Welders". 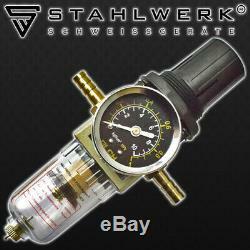 The seller is "*www.stahlwerk-schweissgeraete.de*" and is located in London. This item can be shipped to European Union member countries.